I am 98% empty homes and don't have to worry about blowing circuits in front of customers, etc.... When I do use hwe (use mostly VLM nowadays) I rarely, rarely go over 100' of hose. 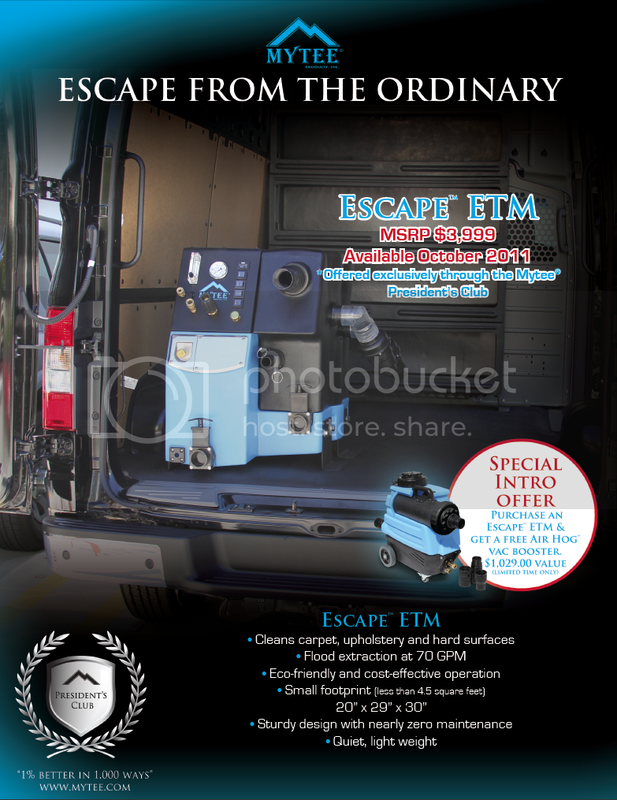 Also remember, since you are using a ETM you can get very creative with parking and pulling into garages? Where a gas TM gives off exhaust, stinks, and is very dangerous? There is no doubt that I will be buying one of these as soon as my TM now either dies or gets sold (lol)!!! Mytee definitely hit it out of the park with this machine.......and the price is great too! So did anyone get to try it at connections? Did they demo it or just show it off?? (09-07-2011, 04:36 PM)Rug Beater Wrote: ...I have a Mitey that I use for T&G and that's always blowing circuits. ...I can't see myself giving up padding for an ETM. I would like to know more about the customer's perception when you do blow circuits. Where are you plugging in most of the time? I wont give up padding either. But, I'm not sold on padding as a stand alone system. It was the easier of the 2 for me to start running, here, in Phoenix. The key is buying a porty that won't pop circuits. Simple right? Not exactly. Everyone is in a power race. MORE, MORE, MORE. I have an older single cord CFX that will clean all the T&G anyone wants without tripping a single breaker. Plug the fancy pressure washer into a different circuit and run until you are done. For carpet, find something that can run 100+ feet of 2" hose with 2 cords pulling 15amps or less. It exists. I've had multiple portys that pulled 15amps or less. The sad part is some of the old houses here can only run ONE 15 amp cord, thus, I started padding and haven't looked back. I use my porty for T&G, pet disasters, and customers with leaking pipes or roofs. Quote: ............I started padding and haven't looked back. I use my porty for T&G, pet disasters, and customers with leaking pipes or roofs. Current time: 04-22-2019, 04:13 AM Powered By MyBB 1.8.17, © 2002-2019 MyBB Group.